Want to get that important holiday off to a good start? Then use Cars Exec, the professional seaport transfer service. We pride ourselves on having luxury chauffeur driven cars, giving you comfort with style. Harwich International Port is a North Sea seaport in Essex, England. It lies on the south bank of the River Stour one mile upstream from the town of Harwich, opposite Port of Felixstowe. The port was formerly known as Parkeston Quay. A member of our team will await your arrival at a designated meeting place, with your name on a board. Once you have met with your driver, they will then assist you with your luggage. A meeting point will be arranged upon making a booking with us. You can sit back and relax in the comfort of our clean, comfortable and stylish executive seaport transfer cars as your chauffeur drives you safely to your required destination. All of our executive chauffeur driven seaport taxis have satellite navigation, giving you a smooth and direct route to your destination. Make your UK seaport transfer experience an enjoyable one by choosing Cars Exec. 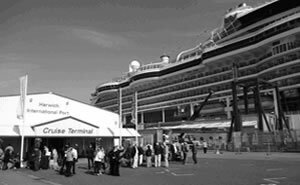 For executive seaport transfers to all major ports including, the Port of Harwich, Cars Exec can help. To book your private seaport transfer today, please call or use our online booking form.